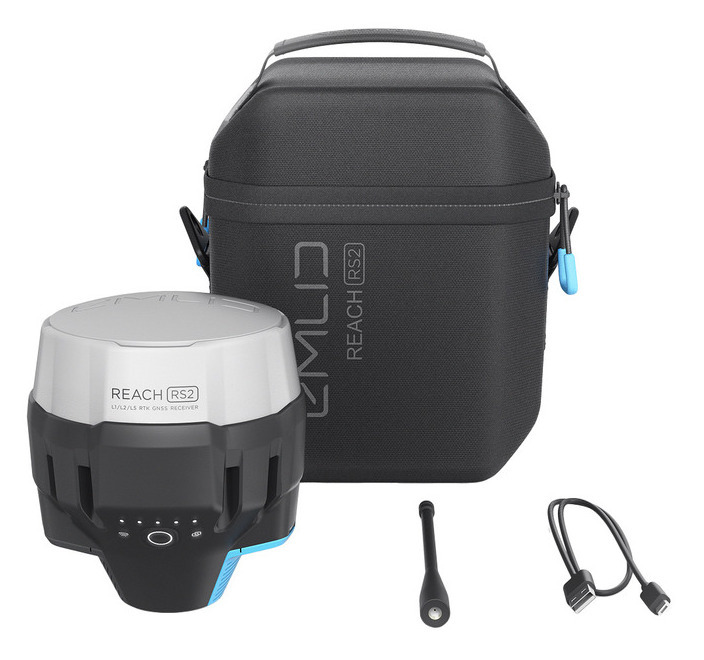 Multi-band Reach RS2 is here! For the past year, we have been working on the next receiver in the Reach line and now are ready to show it. We have listened to all the feedback and suggestions and improved in virtually every area. 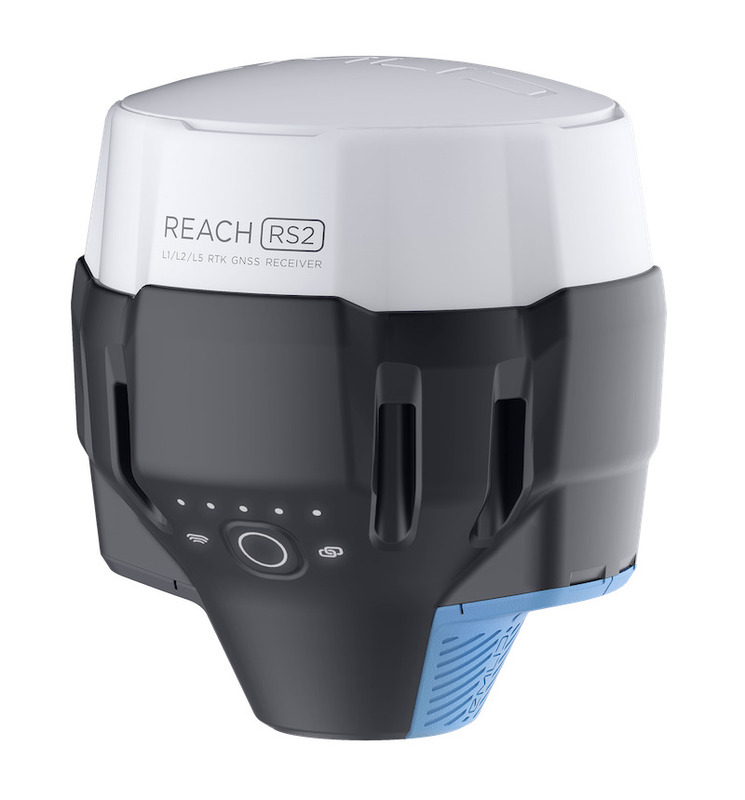 Reach RS2 is a top spec multi-band RTK GNSS receiver for just $1899. When we introduced Reach RS back in 2016, it became clear that many need a survey grade receiver, but couldn’t afford any existing options. It just felt wrong that making centimeter-accurate measurements required a $20k device that worked only with a Windows CE controller. I heard many stories of surveyors using legacy receivers they bought a decade ago—upgrading was too expensive. Engineers, farmers, landscapers, archaeologists, and drone pilots just did not have access to this level of precision and resorted to the use of legacy or imprecise equipment that decreased their productivity. With Reach RS providing centimeter accuracy for $799, we were hardly able to produce them quickly enough and had frequent backorders in our online store. To achieve the low price of Reach RS, some compromises had to be made. 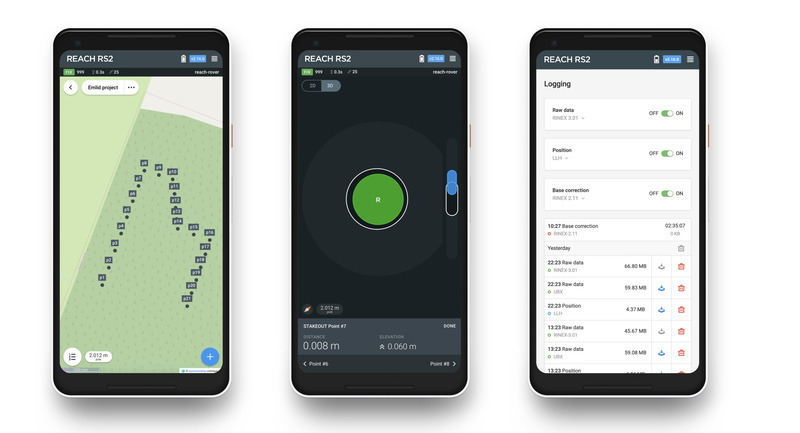 Reach RS is not as performant as higher end RTK devices, yet it gave access to centimeter-accurate GNSS measurements to thousands of users all around the world. When we started working on Reach RS2, there was one clear goal—no more compromise. Covering multiple bands on all major GNSS, Reach RS2 has remarkable RTK performance. Using more systems means that when the sky view is obstructed there are still enough satellites in view to calculate an accurate position. Using L1/L2 bands on GPS, GLONASS and BeiDou and L1/L5 on Galileo make it possible to get a fixed solution in just seconds—even when the base station is dozens of kilometers away. The multi-feed antenna with a stable phase center and multipath rejection ensures that you get precise and fast fixes every time. With support for multiple frequency, Reach RS2 RINEX raw data logs are compatible with OPUS, CSRS-PPP, AUSPOS, and other PPP services. You can now get cm-precise results in any place on Earth. The internal battery is an industrial grade LiFePO4 that handles both high and low temperatures and can endure thousands of recharge cycles. Reach RS2 works for 16 hours with RTK and 3.5G on, a very typical use case that is most harsh on the battery life. If you only need to log raw data in RINEX the working time extends to 22 hours. Others have “hot-swappable batteries,” but in order to get the same working time as Reach RS2, you’d need to change the batteries two times. We are not big fans of battery juggling. Reach RS2 can quick charge over USB-C. It only takes 3–4 hours from zero to full. RS2 charges from any USB port, but for fastest charging, we recommend a 5 V 3 A USB-C Power Delivery wall adapter. If you need to extend the working time from an already impressive 16+ hours, you can connect a USB power bank connector or any other DC power source via 6–40 V power input in the extension connector. Reach RS2 3.5G modem works globally, so you can work with NTRIP wherever work takes you. It will revert to 2G networks if 3G is not available. The nano-SIM card is hidden in a waterproof compartment and can be accessed for replacement without any special tools. LoRa radio in Reach RS2 features ultra-high sensitivity while keeping compatibility with earlier Reach receivers. Known for its long-range performance (some of our users tested it up to 20km), LoRa is used to connect the rover to the base when Internet-delivered corrections are not available. We have also upgraded the LoRa antenna—it is rugged and precisely tuned specifically for Reach RS2. Reach RS2 is engineered to be impact-resistant. The main body is manufactured in a two-step injection process. First, the internal layer is molded out of Polycarbonate, an extremely durable material that is used in bulletproof glass (and Reach RS). A precision CNC machined 5/8″ threaded insert is added during the molding process and becomes one with the plastic. Finally, the hard shell is covered with a special elastomer, forming a shock absorber around the whole device. Compared to conventional silicone bumpers this method offers more strength and better durability. The precision 5/8″ threaded metal insert in RS2 is used to transfer heat away from the components ensuring stable operation in a hot climate. All connectors are protected from water and dust with silicone plugs. There are numerous things that we do “under the hood” that deserve separate posts. These things make Reach really stand out, yet are hidden from the user: custom processing module with a quad-core processor and large memory. Robust OTA updates, onboard crypto, mainline Linux, numerous bits of firmware, kernel drivers. The Reach Platform is a remarkable piece of engineering in which we take great pride. We do thorough testing of every device by running them under full load for 24 hours while verifying operation of every system: GNSS sensitivity, battery performance, 3.5G, memory speeds, Bluetooth connectivity, sending corrections over LoRa and many more. We will check hundreds of parameters before Reach RS2 is considered ready to ship. All that geekery to ensure that your Reach RS2 works perfectly out of the box, that it is secure, robust and receives regular updates with new features. The easiest to use software for GNSS RTK receiver that is available both for Android and iOS. With ReachView you can collect and stakeout points and control all the features of Reach RS2. Setting up a base station, logging RINEX data, configuring NMEA output—all can be done in ReachView. Geodata can be imported and exported as CSV, DXF, and Shapefile. Later this year we are launching the next episode in ReachView development. Stay tuned! It will be a good one! We received plenty of positive feedback about the carry bag that comes with Reach RS. It is light, compact and soft. It does not bump into your legs like the hard plastic case others use. For Reach RS2 our team designed a bag that is even better and looks cooler. The new bag can be opened while hanging from your shoulder and follows the general design approach of Reach RS2. In April our team heads to Amsterdam, Munich, Albuquerque, and Melbourne to showcase Reach RS2 at the industry-leading exhibitions for land surveying, drone mapping, construction, and archaeology. Later on, we 'll be revealing Reach RS2 in Ankara, Novosibirsk, Chicago, and São Paulo. Check when and where you can find us on the events page and schedule a meeting with our team. Reach RS2 is available for pre-order for $1899 with shipping starting in mid-June. The first batch is limited in quantity and pre-order guarantees that you will be among the first to receive Reach RS2. You can pre-order Reach RS2 in our online store. Congratz to Emlid for their new multiband reciver. Simply the design is impressive. Soooo looking forward to the next chapter of this epic story! The design is nothing short of amazing, and the specs likewise! Un-believeable. This is the GNSS receiver that so many serious users have been wanting from you. It is obviously geared for the professional market and high productivity. Multi-band; cellular; LoRa; waterproof; 5/8" thread! ; and on and on. Amazing job you guys! I think you nailed it. Such a great news and great product! A very big congratulations to Emlid team. Just do not understand why LoRa radio is not performing well in my country, Cambodia. It work just around 1km in areas with some buildings and in many cases. Any plans to release a version in the Reach M+ form factor ? Edit: Just wondering about the inclusion of the 3.5 g modem. Will different countries get different freq band customisation ? The cellular modem has support for global bands, so there will be only one version of Reach RS2. Any chance you can list the freq bands ? Precision 5/8" threaded metal insert in RS2 is used to transfer heat away from the components ensuring stable operation in a hot climate. is this the ublox f9 inside? does this do GPS L5? I noticed that the Australian price is $3399 but the USD price is 1899. A quick conversion shows the price should be around $2670. Any reason why there is a markup ? Also I notice now the emlid store redirects to an Australian site with aud dollars. This is local price for Australia, which includes taxes and customs duties. If you order through Emlid Australia your order is shipped from Australia. WOW guys you are truly innovators with world class products ! Cann´t wait to save and order the NEW REACH RS2 ! I don’t know why the aren’t advertising it, but I had heard it’s ublox zed-f8p based. Quite a coincidence “Dirty Harry” knew that in the prior post. There must have been a leak in the secret!